Owls with Attitude consists of 20 Owls, each with its own personality, based on illustrations by Darcy Ashton in her book Outstanding Owls. A soft fleece is used to obtain the appearance of dimension and depth when decorative quilting stitches are added to the applique elements. The eyes realistically incorporate a speckle effect. The use of a softer, feathery, cover stitch perfectly finishes the applique pieces. The pattern includes instructions for creating a Wall Hanging, Tote Bag, or Owl Quilt, and detailed instructions for joining the quilted blocks. 1. Autumn Owls (natural color) incorporates a custom Chrysanthemum background quilting exclusively designed for embroidery machines. 2. 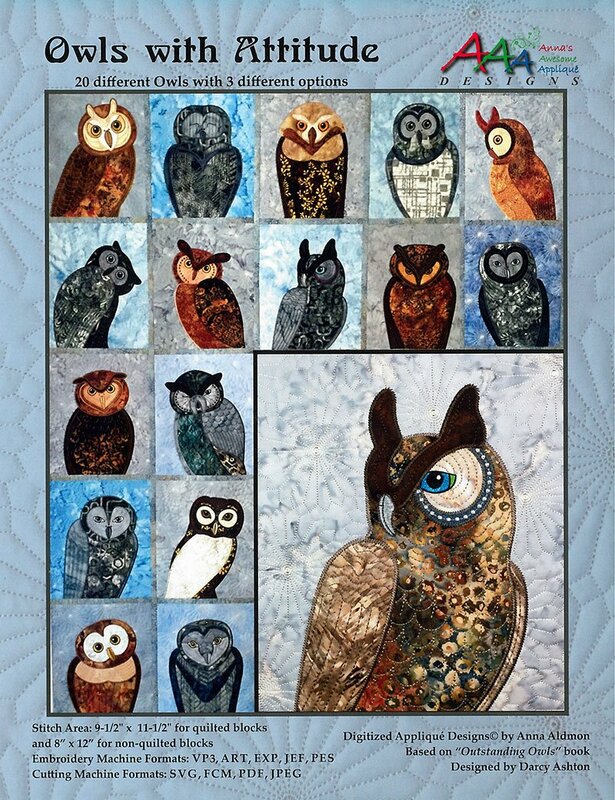 Colorful Owls each have a different background quilting based on well known quilt blocks with a matching 3"" block that can be freestanding or used as corner blocks for a wall hanging. 3. For 8"" wide hoop, all Owls can be done in the hoop without a quilted background. Stitch Area for 20 Owls without quilting background requires an 8"" wide hoop. Stitch Area for 40 (Autumn & Colorful) Owls with quilting background requires a 9 1/2"" wide hoop.